I've had a few people email me asking some questions after seeing the Custom Black Prince Helm with Crest featured on the Web site of Arms & Armor. The Helm of the Black Prince hangs above his tomb and is topped by a crest of a lion. This reproduction was done several years ago but is one we are still quite proud of. The helmet is sized to the original and blued a deep blue-black finish. The crest is made of wood, leather, plaster and paint. It sits atop the helm and is attached by internal laces, as was the original. The client wanted an exceptional piece for their home and was very happy with the results of this commission. 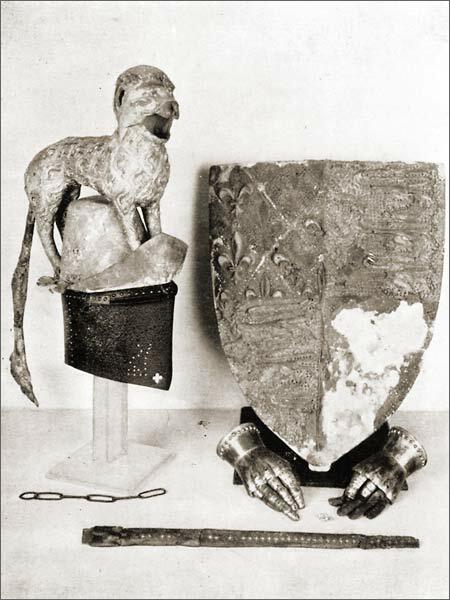 The funeral achievements of Edward, the Black Prince, dated 1376, hung over his monument in Canterbury Cathedral, consisting of helm with crest, shield, gauntlets of copper-gilt, and leather scabbard of his sword. An interesting comment in how tastes change in many ways. It looks like A&A did a fine job creating the reproduction and yet I'm sitting here thinking to myself. "I wouldn't want that on a helm." I'm betting most of the rest of you guys wouldn't either. Am I wrong? What do you guys think? I'd want it because it replicates the original. That is, if I was truly interested in the Black Prince. It's just like historical costumes. I don't judge them on what I wear daily or see in fashion mags, but what I see in contemporary portraits and whatnot. It's interesting because many of the hilts I've chosen to replicate are just plain ugly to my eye with modern sensibilities applied. The South German "continental" varieties I seem to have found to be so interesting are simply awkward to my own sense of style and design. The schiavona is as far from my general leaning towards minimalistic sensibilities, and yet, I find myself extremely intrigued and drawn to the hilt style. This isn't because I find them interesting as to my taste and sense of style, but rather, I find them interesting because of their origin, their form and design when they were developed, etc. For the most part, I personally am often mostly attracted to things that go against my modern sensibilities and introduce me to new ways of thinking. This is a great part of my own fascination with this hobby. I look into this stuff because it opens my eyes to a new world during a different time, and lets me get to know the people who were living in it. Yup, no silly paper hats for me either on my armour. Oh, don't get me wrong, it's a great idea for someone to have had this reproduction made, but what might have been a wonderful fashion statement at the time makes me want to giggle ! On a historical level I wonder if this decoration would resemble civilian headgear that might have been worn by the upper crust ? I would think that these would be for wear at Jousts or festive occasions and not in a serious battle ??? A lot of what would have been considered very " cool " or stylish by Ancien or Medieval people would be considered by us really tacky bad taste. Again, as a display piece A & A did a great job making it and as part of an authentic historical display it's great stuff. I guess one of these " Garnishes ? " with horns & dragons making one look fierce would appeal to me more. If I was attempting to replicate a knight at tournament during that period then yes, I'd want something like that on my helmet. If I wanted to walk around the ren faire and look 21st century "cool" then no, probably not. Recently while trying to recreate some period clothing I had more than one discussion of this nature with friends. "No you shouldn't use that." "But I like the way it looks." "But it isn't correct, this one is." "Maybe today but not a thousand years ago." Needless to say I wasn't always succesfull. But like I said: If I was after a true replication I'd have no choice but to go that way. On the other hand I'm not about to make a Wal-Mart run with that on my head. To start, I'll say I really like that replica, and that there are only a few very minor details I can see that are off in some way or another. I'd be proud to own that! Thanks for the image of the originals, too. I don't think I'd seen one! And, to the other point... I suppose I find myself really lucky, considering I never find anything to be ugly. I can look at a modern car, or a house, or a painting, or an ancient piece of armor, and never think "that's ugly." I always try to bring out the uniqueness and interesting factors in everything, and say to myself that if it doesn't catch my eye overall, what on it does. I'm always sure to find something. I think that's what makes this hobby so cool for me, personally, among other things! For a tournament, I'd certainly like a paper hat with a lion on my helm. In battle, I'd be wary, but, of course, I doubt that's what this is intended for.. I may be wrong and Edward had that bit of flair. I was in Canterbury Cathedral over the summer, and saw the originals. They were all sun-bleached (including the shield) but still quite attractive. One thing that struck me as surprising, however, was how *thin* the scabbard is. It looked almost like a slightly wide rapier at first. Sure but given the choice of having a helm with that crest affixed or having that helm without which would you want? Either one would be period appropriate I would think so let's take period accuracy out of the equation. Or if you feel that the crest is indespensable for the well dressed knight at tournament would you want that crest rather then some other that you have seen in period illustration? I've seen others in such illustrations that didn't make me grin for example. Either way I realize its simply a matter of personal preference I simply find it interesting that in general personal preferences have changed so very much. It's odd that I would find myself the minimalist on this one since I'm often encouraging customers to move beyond their penchant for basic colors in their scabbard choices. Our ancestors did after all dress in a manner that I suspect we would find tacky even garish today. You know Jean I wondered the exact same thing. It sure looks like you could pick that thing up and put it by itself and have an interesting piece of head gear. We know historically that contemporary civilian dress did have an effect on armor design, certainly it can be seen in the sabotons (hope I got that word right) or "shoes" on german suits of armor for instance. I guess it's like Patrick said: If one is a big fan of the Black Prince this would be pretty cool. It is pretty cool anyway, from a historical perspective on fashion and what not. Granted, it does indeed look silly by our standards as you have all said. Back in the day though it would have been quite a site since most people didn't own armor like that and only a king could afford to have something fancy like that. There was another thread i was just reading a bit ago about this (i forget which one though). This instantly makes the nobles identifiable since there were not photographs to go from. So who would want a helm with the fancy schmancy top? Someone interested in historical accuracy and either the Black Prince or other noble types. I dream of owning a crested great helm. The more ostentatious and ridiculous, the better. I also personally believe these were worn in battle, not just at the tourney/joust. There's pictorial evidence for use of crested helms in battle. I love them. I wish there were more on the market. They are fantastic examples of the lengths people went to to say "Look at me! I have money! More money than you do!" One could theorize that an ostentatious crest signaled that you were important enough that it would be wiser and more fiscally to your benefit to capture and ransom you rather than kill you. I don't see the practicality of wearing something that fancy in battle. It doesn't even seem like it would last very long traveling on campaign much less if you saw any fighting. Somebody who wouldn't come to blows, maybe. You have a colorful shield and surcoat to show off who you are and what you are worth. Do you really need a fancy helmet hat? Now the one with the horns would be my cup of tea. And maybe they would be worn in battle, they might not last long though. With the Black Prince example the hat part by itself minus Helm and Lion looks like a fashionable hat that some very rich "Dandy" might wear to impress the peasants when in civilian clothes ( Not in armour ). To be fair the work involved reproducing this by A & A deserves a bit more respect than what my first flip comments may have given the impression: As an art piece it is sort of growing on me. Really nice example of the type of decoration that works for me, gargoyle, dragon or griffon ??? Whatever but very. The rest also looks great also ! HMMMMMMMM; As someone mentioned, maybe it also meant I'm important, I'm rich, I had the best sword masters money could buy, I have lots of loyal retainers and rich relatives who will pay a LARGE ransom for me alive and will seek revenge if I am killed killed. I suspect that the A&A implementation of the crest is a little too severe in the angles and in its precise (and impressive) fit to the helm. The original has a little more naturalistic, rounded, look to it. Good point, maybe we are forgeting that they also had a sense of humour and could have fun with this. I'm surprised that so few have done any research on historical clothing to recognize the style of hat being replicated. I find that this area of study is fundamentally important to the study of arms and armour, as there is a back-and-forth evolutionary influence between the two. 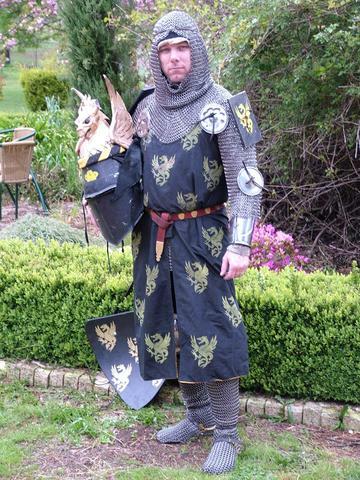 Besides, so many people of this community are into recreating a persona or at least understanding how the items of arms and armour fit into the context of the period. Again, with this, the study of period clothing and dress is crucial. I can understand one's lack of interest to do any serious study on the matter, but the study of portraits and historical art is a key ingredient in understanding arms and armour of the period. Being exposed to this artwork inevitably opens the world of historic dress to the scholar. I'm surprised that so few have done any research on historical clothing to recognize the style of hat being replicated. I find that this area of study is fundamentally important to the study of arms and armour, as there is a back-and-forth evolutionary influence between the two. I agree - there is a significant relationship between the two. Lots of armour followed the fashion of the day. One simple example - peascod/doublet. My understanding increased tremendously when I added the study of period art to the mix. The example of the peascod belly goes both ways. There are discussions of the clothing style following the style of the breastplate (which was shaped to deflect blows). There are also discussions of the opposite. Regardless, there are as many examples of clothing influencing armour as there are of armour influencing clothing. The entire discussion is absolutely fascinating. One can find inspiration in Ewart Oakeshott and his intense knowledge of the inter-connected ties that bond art, fashion, architecture, arms, armour, etc. 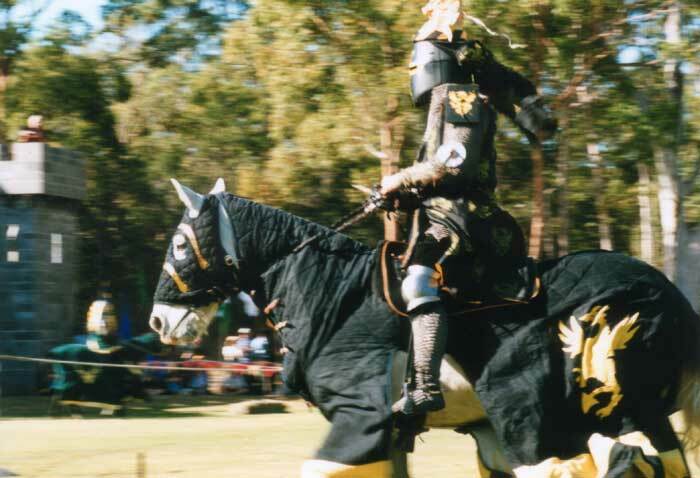 Thanks Jean, here is the kit in use at a jousting tournament a few years ago. The overall effect of the harness, caparisons and surcoats is not complete without a suitable crest.